There is nothing better than coffee. But what about a coffee in a unique space? Emily says that the Warhorse Coffee Joint at The Goat Farm is a hidden gem. The menu is limited so it's not a coffee shop in the strict sense, but a place for the community to come hang. Bring cash as you pay by simply dropping your donation in the jar. Grab your coffee and enjoy the unique ambiance of the Warhorse or take it outdoors where you can stroll through the diverse spaces, home to artists’ studios. You might even spot a few familiar sights as it has been the backdrop to a number of feature films and television shows. “Make real the promises of democracy"
We have all seen the footage of the speech that changed history. Go and immerse yourself in the life and times of Martin Luther King, Jr. and make sure that the power of his words remain in our hearts and minds. A sobering thought that his activism remains as relevant as ever, as the hugely thought-provoking contemporary Center for Civil and Human Rights demonstrates. Some fascinating exhibitions and events are taking place in April. The South is synonymous with bitter-sweet romance, sweeping historical dramas set against a backdrop of plantations, Civil War and reconstruction. Gone with the Wind author Margaret Mitchell received the Pulitzer Prize for Fiction for it in 1937, and it remains the second most read book in the US (2014 data). Anyone with a mobile phone can take photos so we can all be artists now. Where better to delve into the myriad ways a photograph can be a conduit for ideas, information and emotion than Look Again: 45 years of collecting photography at the High Museum of Art? And to continue the photo-op theme, be insta-inspired by the Krog Street Tunnel. For those into The Walking Dead, you can find filming locations of the popular TV series - keen fans can make the trip out to Riverside Studios. Although the show might have made the Jackson Street Bridge famous, it’s long been a beloved spot for locals, photographers, and tourists to take in one of Atlanta’s best views of the city skyline. Both during and after a busy conference you’ll need to assimilate what you’ve learned, so be kind to yourself and head towards one of Atlanta’s many green spaces. Piedmont Park has more than 180 acres of open space, walking trails, tennis courts and playgrounds. If you’re staying in Atlanta for a little longer, why not attend April’s 83rd Annual Dogwood Festival? Emily says that Oakland Cemetery is a beautiful and historical place for a walk. It’s Atlanta’s oldest public park and the final resting place of many of the city’s most notable citizens. Less than a mile from downtown, its 48 acres are full of treasures – history and gardens, sculpture and architecture, ancient oaks and magnolias. Hungry after all that? We aren’t surprised! Atlanta has developed an unrivaled reputation in the foodie-sphere and Emily especially recommends Mary Mac's Tea Room - voted Atlanta’s dining room, with a wide selection of Southern specialities, my mouth is already watering. Her other recommendation is Fat Matt's Rib Shack which has great live music - Blues and ribs make it a winner in my book! For a full on experience, head to Ponce City Market. In the Central Food Hall, artisan chefs and local suppliers ﬁll an authentic market with the design, food, and ﬂavors of Atlanta. From morning coffee to lunchtime shopping and date-night dinners, the Central Food Hall is a fantastic place to meet and eat! You’ve seen the sights, tried some true Atlanta cuisine, so now sit down with new friends and colleagues in one of the many bars. So many to choose from but I’d go with a local suggestion. For amazing views, try The Sundial with its 360 degree view of the city or O-ku which has a lovely rooftop bar. For wine lovers, try cozy and beautiful Tin Tin. For those who enjoy craft beers, creative and innovative New Realm Brewery is the place to be. #LMA19 is taking place in the Hyatt Regency Atlanta which is conveniently situated in the heart of the city and close to all the major sights. 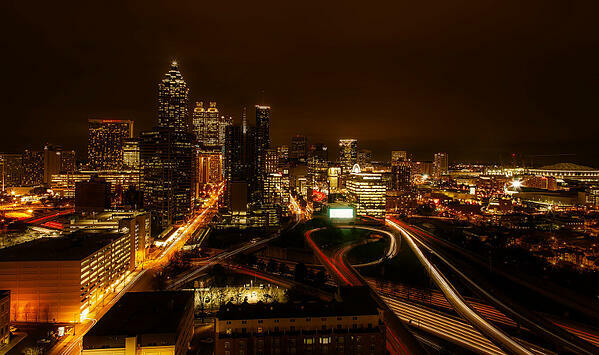 This is just a glance of what’s on offer in Atlanta, with plenty more to be discovered. Will we be seeing you there? Come and say hello at booth #212 for a demo of our current awareness platform.